The fifth and final volume of films from the BBC's A Ghost Story for Christmas series will be released by the BFI in October. The release of A View From a Hill and Number 13 brings this much anticipated collection to a total of a dozen films across five volumes, which will also be released together in a 5-disc DVD box set, Ghost Stories for Christmas, on the same date. This final volume contains two relatively recent adaptions of classic M.R. James stories, which perfectly complement the vintage films on the previous volumes. They were broadcast as part of a BBC revival of the much loved seasonal A Ghost Story for Christmas series during the last five years. When young museum curator Fanshawe is sent to catalogue a debt-laden squire's archaeological collection, he uses a pair of homemade binoculars borrowed from his genial host to survey local 'Gallows Hill'. The glasses seem to give him a strange new ability and, ignoring all warnings about their necromantic creator, Fanshawe carries out his historical researches. But the bloody past of the area is best left undisturbed. Adapted from a short tale by M.R. 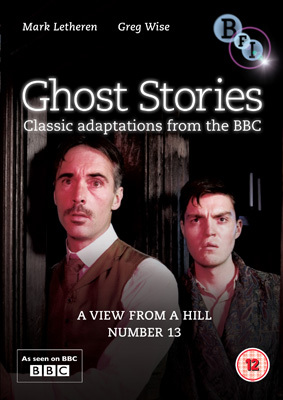 James, the master of the English ghost story, A View From a Hill remains faithful in spirit to its literary creator, with an excellent lead performance from Mark Letheren as the uptight, doomed Fanshawe. Dissatisfied with his hotel room, Professor Anderson (played by Greg Wise) demands to be moved to number 12 where he can work undisturbed. But, infuriated by the ghoulish noises made nightly by his neighbour, he is soon driven to investigate the diabolical secrets of the old hotel and its mysteriously vanishing room 13. M.R. James' spooky tale was shot in the grounds and library of Winchester Cathedral, lending a rich period atmosphere to this terrifying adaptation. Ghost Stories for Christmas, Volume 5 will be released on UK DVD by the BFI on 29th October 2012 at the RRP of £19.99. The RRP of the box set is £49.99.